Using today’s ultra light rods, line and baits; savvy anglers can use the ice to overcome disadvantages that face us during the open water season. With lightweight portable shelters, we can overcome problems of wind, noise and unwanted movement. Even though bluegills might be technically less active in the cold water of winter, we can compensate by selecting prime locations and offering baits more attractively. For the next few months, we have nearly absolute control over how and where we fish. We can fish them more thoroughly, more quietly and more efficiently than we can in summer. Every so often I’ll mention the idea of Bluegill fishing to whichever customer happens to be with me that day. The first reaction is usually just "a look". You know that look on someone’s face that says; "you’ve got to be kidding man, we can get those right off the dock!" That’s right, a lot of times you can get ‘em off the dock and in a lot of other places too. But zeroing in on high quality Bluegill fishing is a different proposition altogether and once we find them, that "look" usually turns into one of amazement and happiness. I’ve never seen grown ups get the fifth grade giggles more often than they do when they’re catching quality Bluegills. That’s what’s so great about these fish; pound for pound, they are the swimmin’est, pullin’est fish that roams in fresh water. Bluegills like this one can give anybody a case of "Gill Giggles". Before packing up the truck, we’ll need to do a little homework because even though most of us have "stumbled into" a nice mess of ‘gills from time to time, finding the really high quality Bluegill holes consistently, is an art that begins well before arriving at the lake. Picking one of the better Bluegill lakes is the most important decision about the trip. If I’m taking my kids fishing, I might accept more action instead of quality size and that’s a terrific trade off when keeping the kids interested is important. But if it’s a trophy I’m after, researching lakes that offer large fish will pay out big dividends. Bluegills of trophy size aren’t going to be in every lake, so we have to dig around for information that gets us pointed in the right direction. For me, a good system is to grab a map and pick out several lakes in an area I like. I think it’s best to have several options within easy driving distance of each other. Looking at the map helps me remember some of the lakes I’ve heard of or fished in the past and gives me some ideas of ones I want to learn more about. Once I’ve picked out a few possible choices, I’ll use the Internet to access the lake information on the DNR Fisheries web pages. I can learn a lot by reading the surveys about these lakes and it helps to form a preliminary list of places to try. I want to find lake-survey information that’s been gathered recently enough to be accurate when I need it. But even if it seems outdated, there’s a good chance it will give me some valuable hints about the lake’s makeup and offers potential clues as to it’s Bluegill population. I want to find lakes that show signs of having larger bluegills plus some evidence of a good population of larger Bass. Largemouth Bass, particularly large ones eat small Bluegills and lakes with lots of nice Bass are less likely to be overpopulated with stunted Bluegills. Once I’ve used the lake surveys to get in the ballpark, I might compare notes with the folks at the bait shop, ask friends who have fished the lake in the past or check the local fishing papers for photos from the past summer. All I need is a hint that the fish are really in there. I don’t waste too much time trying to pry for details or secrets from folks that fish the lake because this information has a way of running it’s course in a hurry. By the time I learn about a so-called "hot bite", it’s usually getting close to the end of the run. In the long run, the absolute best way to find these fish will be to strike out on my own and find "new fish". In winter, fish are fairly easy to thin out and unless you’re one of the "Early Birds" who finds them first, it’s unlikely that you’ll have that once in a lifetime experience of finding that magic hole in time to really enjoy it. 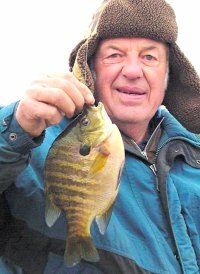 Like all fish, Bluegill location depends on food. Insect larvae, small crustaceans and snails are all on the menu. In summer, Bluegills will feed on newly hatched, vulnerable small fish too. But, in winter, Bluegills are much less likely to feed on minnows and it’s unusual to find lots of them in open water like we do Crappies. Softer bottom, weeds and areas with soft snags like branches or stumps are all good breeding grounds for these insects and tiny critters. These areas can hold Bluegills for several days at a time. Early season Bluegill locations tend to be near deeper, open water late fall haunts. Conditions have been stable and fishing pressure has been practically non-existent for a couple of months, so there’s been little reason for the fish to move. A good approach is to move out from the shallow-water weed flats toward the edges of deeper soft bottom holes. I like to find a deeper hole near the shoreline with plenty of shallow weed cover close by. Later in winter, fish will begin to move back into shallower water with plenty of cover so areas like these have something to offer all winter long. Finding fish is fairly simple as long as you keep moving. This is where modern equipment has really changed the way we fish. You could say that the small, portable ice shelters developed by Dave Genz in the early eighties started a revolution in ice fishing. These small portables provide warmth, protection from the wind and provide a convenient way of moving equipment from spot to spot and it’s all on a sled light enough to pull by hand. Recent improvements like lightweight Lazer augers that cut like magic, electronics developed especially for ice fishing, a host of light rods and tackle containers make it easier than ever to stay on the move. All of this stuff has been developed because the system works! Drilling lots of holes and fishing each one only long enough to discover its potential is the key to finding fish. If you’ve spent 10 minutes over a hole without catching some ‘gills or at least seeing some fish on your locator, it’s time to move on. Bluegills will bite during the day, so it’s usually not necessary to spend hours waiting for "prime time". It’s better to go find them. Ideal rods for Bluegill fishing should be limber enough to protect your line from breaking, but not so soft in the tip that it cuts down on sensitivity. The "light tick" of a Bluegill bite can be felt easily with a moderately priced graphite rod. If you’re careful, 2 pound test line will really improve your presentation, but 4 pound will do a fairly nice job most of the time. I like Trilene and I get the green color to make it a little easier to see. Baits should be small in size, but not necessarily light in weight. A little extra weight is really handy for getting the bait down in a hurry and it gives you a better sense of feel. In most cases baits weighing 1/8 on down to 1/32 ounce with a size 4, 6 or even smaller hook will catch Bluegill. One of my favorite bluegill baits is a 1/8-ounce round jig head similar to the ones I’d use for Walleye, except with a smaller than normal, #4 hook. When tipped with a wax worm, maggot or golden rod grub, these jigs are perfect for winter ‘gills. Jigs like Lindy’s fat boy, Ice Worm and Toads are nice size and balanced well for Bluegills. Smaller blade type baits, ants and plain hooks can all be fished fairly well with split shot added a few inches above the jig. Finally, one really neat trick is to wrap the shank of a plain hook with the lead wire sold in fly tying supply shops. The lead wire comes in a variety of diameters and you can customize you bait to any weight you like. Presentation should be simple and steady. Bluegills generally like a more stationary approach and this is where the heavier weight baits will help keep your offering in front of the fish. Unlike Crappie fishing, I prefer to fish without a float for bluegills. Using ultra-light 2-pound test monofilament and a matching light rod, try dropping your bait down to the bottom and then lifting it slowly up to about 6 inches above the bottom. Hold the bait fairly still and at the first sign of the typical Bluegill "tick", set the hook with a flick of the wrist. If there are fish nearby it won’t take long to get a few bites or at least see them on your flasher. If there’s no contact, start hoofing it! The faster you cover the territory, the better the system works.